You can choose a subscription plan that includes Word documents and shapefiles along with your data. Download the sample shapefile for this project. 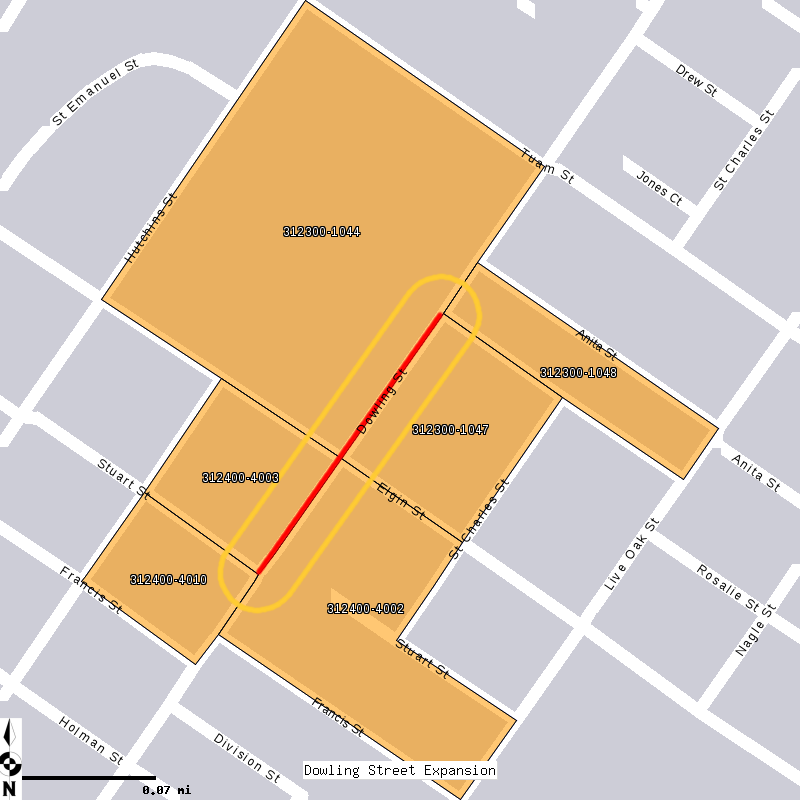 Shows Census Blocks that intersect the Dowling Street Expansion project (red line) and a 100 foot buffer (yellow line) Note: you can make the buffer larger or smaller than 100 feet. Source(s): Texas State Data Center. 'Population Projections for the State of Texas and Counties-Scenario 0.5.' http://txsdc.utsa.edu/tpepp/2008projections/ (June 2010). 2 Small area Census geographies are named by their FIPS codes (State FIPS-County FIPS-Tract FIPS-Block group FIPS & Block FIPS). 3 The U.S. Census 2000 considers race and ethnicity to be separate identities. SF1 Table P8 provides race data by "Hispanic or Latino" and "Not Hispanic or Latino" ethnicities. [Insert appropriate agency definition of minority here. For example: The US Department of Transportation Order on Environmental Justice (April 1997) defines a "minority" as a person who is Black, Hispanic, Asian American, or American Indian/Alaskan Native. "Minority population" is defined as "any readily identifiable groups of minority persons who live in geographic proximity, and if circumstances warrant, geographically dispersed/transient persons (such as migrant workers or Native Americans) who will be similarly affected by a proposed DOT program, policy or activity."] Block data indicate that minorities live in the project area. Additional analyses are needed to determine if the project will result in disproportionately high and adverse effects to minorities and minority populations. 1 Small area Census geographies are named by their FIPS codes (State FIPS-County FIPS-Tract FIPS-Block group FIPS & Block FIPS). 1 Small area Census geographies are named by their FIPS codes (State FIPS-County FIPS-Tract FIPS & Block group FIPS). [Insert appropriate agency definition of low income here. For example: US Department of Transportation Order on Environmental Justice (April 1997) defines "low income" as a person whose median household income is at or below the Department of Health and Human Services (DHHS) poverty guidelines. "Low income population" is defined as "any readily identifiable group of low-income persons who live in geographic proximity, and, if circumstances warrant, geographically dispersed/transient persons (such as migrant workers or Native Americans) who will be similarly affected by a proposed DOT program, policy or activity."] The 2011 DHHS poverty guideline for a family or household of four is $22,350. Data in the Income Data table were collected in 1999, and the 1999 DHHS poverty guideline for a family or household of four is $16,700. Block group data indicate that low income populations live in the project area. Additional analyses are needed to determine if the project will result in disproportionately high and adverse effects to low income populations. This data is for the civilian, noninstitutionalized population age 5 years and over. Within area block groups, Census data record the presence of persons who describe their ability to speak English as less than "Very Well." The table below shows the percentages of adults who speak English less than "Very Well" by language category. Additionally, 39 households or 5.8% of households within area block groups reported to the Census that their household was linguistically isolated, meaning that all household members over the age of fourteen had at least some difficulty with English. Thus, Census data indicate the presence of LEP populations. Since LEP is partially defined as a limited ability to read and write English, literacy data were also consulted. Indirect literacy estimates for adults were calculated by the National Center for Education Statistics based on 2003 survey data for states and counties. The percentage of adults who lack basic prose literacy skills for Harris County and Texas are 21% and 19% respectively.1 While literacy estimates do not differentiate between low literate English speakers and low literate LEP populations, literacy data should be considered along with other LEP indicators in determining how to best provide access to LEP populations. To supplement Census and literacy data, area school district (ISD) data were consulted for indicators of LEP populations. School districts collect data on the number of English Language Learners as defined by each state's Department of Education and migrant students as defined in 34 CFR 200.81(d). For school year 2005-06, HOUSTON ISD reported 27.9% of students as English Language Learners and unknown percent as migrant students. In conclusion, the data indicate the likelihood of LEP populations in the area. © 2011 Cubit Planning excluding data provided by U.S. Census Bureau, National Inst. For Literacy, National Center for Education Statistics and Population Projection data.